food: sausage bake | eat. drink. fly. i know i’ve posted about this meal before on previous blogs that i’ve run, but it bears repeating for 2 reasons. first off, it’s incredibly delicious & easy. second, it’s always changing based on whats on hand. i selected 3 kinds, and they were all winners. wild boar, venison with blueberries and an okanagan pork sausage with local red wine in it. for veg, we used golden beets, baby potatoes, carrots, leeks, sweet onion, cherry tomatoes, fennel and red peppers. and lots of fresh rosemary. a little olive oil, salt & pepper and she’s good to go. 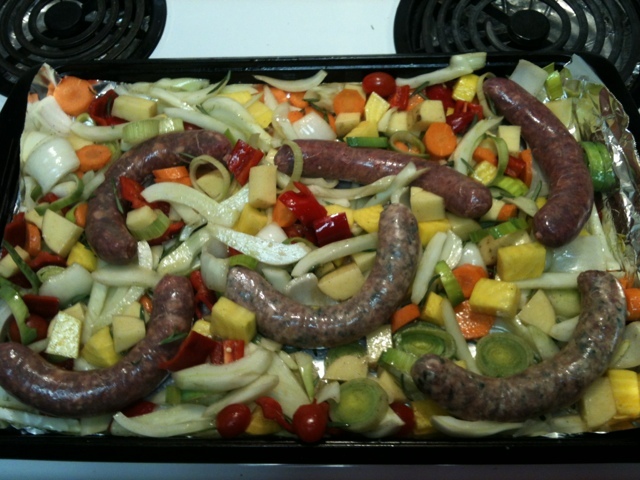 425 for about 40 minutes, then i removed the sausages and let the veggies go for another 20 mins. 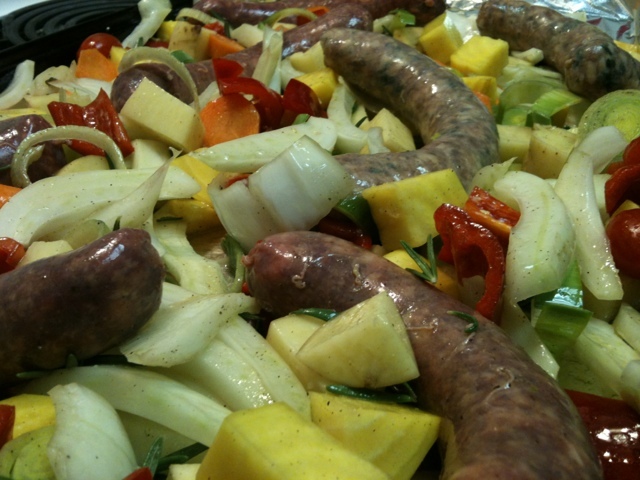 here’s the finished product, with one of each sausage. all of the sausages were delicious, but i think the venison was my top pick. the boar, unfortunately got a little overcooked and was a bit dry. totally my fault, it had a lower fat content and should have come out earlier. the flavour of it was still incredible. the venison was so juicy and the blueberries added a lovely little flavour punch. the okanagan pork sausage was crazy good too. super juicy and a strong red wine flavour to it. i’d buy any and all of them again. once again, i’d like to thank that sultry minx nigella lawson for bring this recipe to my attention. it’s a winter & fall staple in my house now. hot damn that looks mighty! thanks for the FB link jeremy! i hope you guys steal & enjoy the recipe. it’s a good’er! Oh Nigella, that dirty whore. She always knows best. Those sausages look absolutely amazing! nigella is a total whore. and thats why we love her. 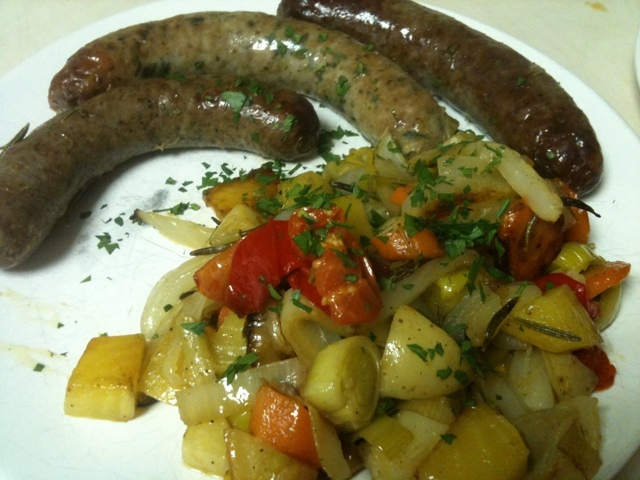 Trackback: food: beets & sausage « food, drinks & travel.